today's giveaway comes atcha from a real life friend of mine, jamie. jamie is a super talented seamstress & can whip up pretty much anything with a few pieces of fabric, some coffee & a few hours in the middle of the night. because that's when she crams in all her work designing & creating items for her amazing shop lilybaby! the rest of her time is spent wrangling these two super cute munchkins. bad news? right now her etsy shop is a little on the empty side. she's been kept very busy lately filling custom orders so her on-hand items aren't many. good news though? she is available for custom orders & does an amazing job with items all across the board. crib bedding, hoodies, dresses, you name it i bet she'll do a rockstar job at creating it. 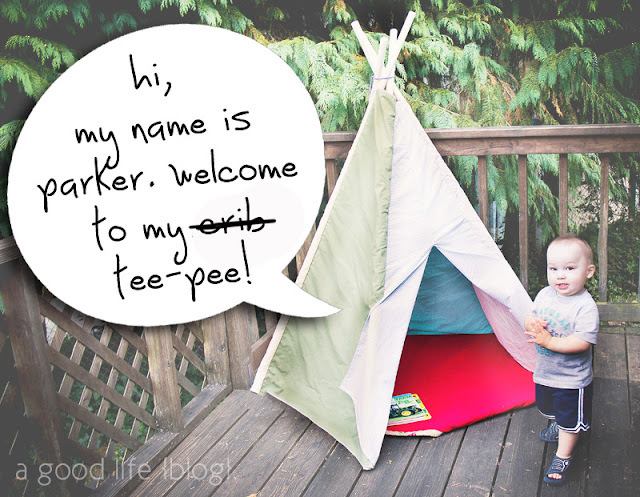 more good news: today she is giving away a teepee to one of my readers. yup, just like p-ray's teepee seen below, this could be yours. i'll let parker take it from here. "here's the outside... here's me in the inside... and now here's me running around in the yard eating an apple off the ground. catch ya later!" if you live in washington state in the greater seattle/south puget sound-ish area, jamie is willing to give away the main canvas along with a set of poles & come meet you to deliver the goods. if you live out of the seattle area she will ship you the canvas with pvc pipe pole specifications. it's super easy to go to home depot & have them cut the poles & it costs less than $10.00. so please don't let this be a deterant from entering! • visit lilybaby's etsy shop & comment here telling me what you'd love to have! • "like" lilybaby on facebook & tell jamie wether you're local or would need to have the teepee shipped out of the area. • favorite lilybaby's shop on etsy. there ya go! four chances to win & as always, leave a separate comment for each entry ya do. giveaway ends october 10 at 11:59 pst. and remember, if you live out of the seattle area, please only enter if you're willing to go buy the poles for the teepee! many thanks. also? many thanks for many votes too. thank you thank you thank you. i love all the dresses! but i absolutely love the Avery hoodie. aaand added shop to favorites. I love the Avery hoddie! I remember when you first posted about the teepee I went to her site and was bummed i didn't see it. I am glad she does custom orders. if I bought anything from her that would the top of my list! The 2nd thing would have to be the avery hoodie I love it! The avery is still so cute!! This tee pee is adorable! The Avery hoodie for sure - boys are so hard to find cute things for! I would love the Avery Hoodie for Bennett! Liked her on facebook, and yes I live locally! The Avery Hoodie is cute! Thanks for the chance to win! DS would LOVE a teepee! I love the Avery hoodie. I wish the model was wearing the blue one! i really like the avery hoodie, but love love love the teepee (even though it's not in her shop right now). added to favorites on etsy! This sounds like such a great giveaway! I think her Avery Hoodie and Ultimate Cozy Cardigan are soooo adorable! I'd love to see Dustin in one! Awesome Giveaway! I love the avery sweater. The dresses are so cute but we have all boys in my family. Ok, I haven't entered a giveaway in a while. So here goes. I "liked" her on Facebook. I'm baaaack! She has lotsa cute stuff, I've seen it before on your site. I am diggin' that cozy cardigan today. Okies, added her as favorite on Etsy. I <3 Etsy! The Avery Hoodie!!!! I just might have to snag it for my daughter, it's too cute. Aaaand just for good measure, I'm following her blog now! Fingers crossed for me!! The Avery Hoodie is precious - especially on little Parker! She is now an Etsy favorite! Love, love the Avery hoodie! Liked the FB page & left a comment for her. So cute, oh my, the one shoulder dress is amazing! If only the weather here were warmer! I favorited her shop too! Liked her shop on FB too! I would LOVE the Avery Hoodie! I commented on her facebook page! I like the avery hoodie! I love the avery hoodie yo. I like on FB. and I live in OR and travel up to Seattle a lot. Probably wont need to ship. And, I liked her Etsy shop. Love the Avery Hoodie and the teepee!